Eurol Coolant XL-NM -36°C | Eurol B.V.
Eurol Coolant XL-NM -36 is coolant, based on mono-ethylene-glycol and organic corrosion inhibitors (silicate-free, with nitrite). Eurol Coolant XL-NM -36 prevents from scale formation and offers an excellent protection against cavitation. Moreover, it protects metal parts in the cooling system against corrosion. Eurol Coolant XL-NM -36 is amine, borate, phosphate, nitrate and silicate-free and in this way, contributes to a cleaner environment. Eurol Coolant XL-NM -36 is completely safe for rubber, plastics, metals and aluminium or its alloys. Eurol Coolant XL-NM -36 is a modern coolant for water-cooled combustion engines and protects the system from freezing up to -36 °C. 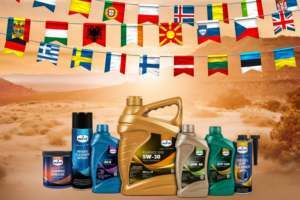 Eurol Coolant XL-NM -36 is diluted with water, so ready to use.